To understand the correlation between the mesoscale structure and the frictional strength of an active fault, we performed a field investigation of the Atera fault at Tase, central Japan, and made laboratory-based determinations of its mineral assemblages and friction coefficients. The fault zone contains a light gray fault gouge, a brown fault gouge, and a black fault breccia. Samples of the two gouges contained large amounts of clay minerals such as smectite and had low friction coefficients of approximately 0.2–0.4 under the condition of 0.01 m s−1 slip velocity and 0.5–2.5 MP confining pressure, whereas the breccia contained large amounts of angular quartz and feldspar and had a friction coefficient of 0.7 under the same condition. Because the fault breccia closely resembles the granitic rock of the hangingwall in composition, texture, and friction coefficient, we interpret the breccia as having originated from this protolith. If the mechanical incorporation of wall rocks of high friction coefficient into fault zones is widespread at the mesoscale, it causes the heterogeneity in friction strength of fault zones and might contribute to the evolution of fault-zone architectures. The evolution of frictional strength during the seismic cycle is an important issue for seismology and earthquake prediction. Many laboratory studies have measured the coefficient of friction in faults at slip rates ranging from ultraslow (10−9 m s−1) to fast (1 m s−1) (e.g., Byerlee and Brace 1968; Byerlee 1978; Mizoguchi et al. 2007; Di Toro et al. 2011; Ikari et al. 2015). Coseismic reduction in fault strength, by thermal and tribological processes such as thermal pressurization (Sibson 1973) and powder lubrication (Reches and Lockner 2010), is also an important factor in the behavior of fault slip during earthquakes. The physical and chemical processes that produce this weakening have typically been investigated by integrating friction experiments with analyses of the products of friction (e.g., Wibberley and Shimamoto 2005; Han et al. 2007; Brantut et al. 2008; Boulton et al. 2012; Hirono et al. 2013). Only a handful of studies so far have clearly been examined the microstructures of experimental products (e.g., Brantut et al. 2008; Han et al. 2014). The postseismic recovery of fault strength (also fault healing) and the heterogeneity in fault strength are another problems that are closely related to the seismic potential and recurrence interval of fault slip, the source parameters of future earthquakes, such as stress drop, and the evolution of fault-zone architecture. Healing rates have been estimated in active faults on the basis of an increase in seismic velocity from 1994 to 1998 after the 1992 Landers earthquake on the Johnson Valley fault, California (Li and Vidale 2001) and the changing direction of shear-wave splitting after the 1995 Kobe earthquake (Tadokoro and Ando 2002). Fault-healing processes have also been studied in laboratory experiments examining stick-slip behavior (Brace and Byerlee 1966), the strength increase in simulated fault gouge with respect to the contact duration at grain junctions (e.g., Dieterich 1972), shear load perturbations (Karner and Marone 2001), and crack sealing via fluid-assisted pressure solution compaction or mineral precipitation (e.g., Olsen et al. 1998; Bos and Spiers 2000; Muhuri et al. 2003; Niemeijer et al. 2008). However, in natural fault gouges, complex mesoscale and microscale deformation structures (fabrics) are common, such as granulation, preferred grain orientation, Riedel and Y-shear planes, and fluidized granular flow (e.g., Borradaile 1981; Rutter et al. 1986; Niemeijer et al. 2012; Rowe and Griffith 2015). The composition of natural fault gouges also shows complex variation: Many gouges consist largely of clay minerals such as smectite and illite (e.g., Vrolijk and van der Pluijm 1999; Hirono et al. 2008a; Lockner et al. 2011), although sandy gouge has been reported in the major thrust in the Nankai Trough (Hirono et al. 2014a). Because understanding the role of microscale deformation structure (fabrics) and mineralogy in fault gouges is important for developing process-based models of friction, many experimental studies have been performed (e.g., Ikari et al. 2011). These have shown that mineralogical composition influences the strength and stability of a fault (e.g., Byerlee 1978; Shimamoto and Logan 1981; Brown et al. 2003; Faulkner et al. 2011; Ikari et al. 2011) and that the frictional strength is closely related to the evolution of deformation fabrics during slip (e.g., Collettini et al. 2009; Oohashi et al. 2015). However, relatively little is known about the role of mesoscale deformation structures in the slip behavior and evolution of faults, even though fault gouge may be substantial. For example, a fault gouge on the Taiwan Chelungpu fault is 13 cm thick and has a complex structure that includes localized slip zones (Ma et al. 2006; Hirono et al. 2008b). The purpose of this study was to investigate the relationship between the friction coefficient and the zonal evolution of a fault gouge. Specifically, we documented the mineralogy, deformation structures, and friction coefficients of fault materials at a site on the active Atera fault in central Japan. In this paper, we present the results and discuss heterogeneous fault strength from a mesoscale perspective. The left-lateral Atera fault system, extending 66 km in a NW–SE direction in Gifu Prefecture in central Japan (Fig. 1a), has been active since the early Quaternary within an E–W compressive stress field (Sugimura and Matsuda 1965). Its latest activity has been correlated with the 1586 Tensho earthquake (Toda and Inoue 1994, 1995), and its average displacement rate has been estimated at 2.8 mm per year (Tsukuda et al. 1993). Around the village of Tase, the fault zone has a reverse shear sense with a N38°W strike and 60°N dip. 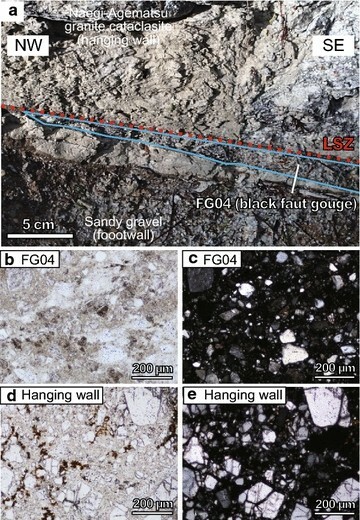 The hangingwall consists of the Late Cretaceous Naegi-Agematsu granite cataclasite, and the footwall consists of Quaternary sandy gravel (Fig. 1b). There, the fault zone contains a light gray fault gouge, a brown fault gouge, and a black fault breccia (Fig. 1c). The brown fault gouge has been identified as the latest slip zone, probably corresponding to the 1586 earthquake, because it cuts all other gouge layers without distortion (Kato et al. 2015). We collected 18 samples from the fault gouges and surrounding host rocks to investigate their mineralogy, deformation fabrics, and friction coefficients. Mineral assemblages of the samples were previously analyzed by Kato et al. (2015) by means of X-ray diffraction spectra obtained by using an X’Pert PRO MPD spectrometer (Spectris PANalytical). The samples were blended with α-alumina (25 wt%) as an internal standard and mounted on a plate by the side-load method to minimize the preferred alignment of the phyllosilicates, and the mineral assemblages were determined by using the RockJock program (Eberl 2003). Friction coefficients were measured by using a rotary shear apparatus (described in Mizoguchi et al. 2009). Approximately 500 mg of water-saturated powdered host rock was placed between the ends of two cylinders of sandstone (25 mm diameter) and sealed in a polytetrafluoroethylene sleeve to prevent leaks. The experiments were performed at ambient humidity under normal stresses that were increased in 0.5 MPa increments from 0.5 to 2.5 MPa. The friction coefficient has been shown to be generally velocity dependent and to have its peak value at velocities around 0.01 m s−1, independent of rock type (e.g., Di Toro et al. 2011; Niemeijer et al. 2012). In addition, values at high slip velocities of 0.1–1.0 m s−1 reflect the effects of weakening mechanisms such as powder lubrication (Reches and Lockner 2010) and thermal decomposition (Han et al. 2007). We thus adopted a velocity of 0.01 m s−1 to represent peak friction during earthquakes. The shear stress was measured with a slip displacement after a correction for friction between the rock cylinders and the sleeve (approximately 0.01), which was determined from the shear stress at zero normal stress. Thin sections of the samples were carefully prepared after being impregnated with epoxy resin and polished and then observed under a petrographic microscope. The fault zone at Tase displays three structural zones that differ from one another in their mineral compositions (Fig. 2). The light gray fault gouge contains a small proportion of K-feldspar and plagioclase and a large amount of halloysite and smectite, compared with the mineral assemblage of the surrounding host rocks. The brown fault gouge (thought to have hosted the 1586 rupture) has slightly more smectite, and the black fault breccia does not show a marked difference in the mineral assemblage. These mineral compositions may be related to the elemental compositions reported by Kato et al. (2015), who found relatively high Al and Mg and low Na and K concentrations in the light gray fault gouge. The frictional behaviors of five representative samples across the fault are shown in Fig. 3. The relationship of shear stress to normal stress was strongly linear (Fig. 3f), and the friction coefficients of the fault materials were as follows: hangingwall, 0.77; footwall, 0.78; light gray gouge, 0.19–0.24; brown fault gouge, 0.40 and 0.43; and black fault breccia, 0.70 (Fig. 4a). The friction coefficients of all samples were inversely related to the total clay mineral contents determined by the XRD-RockJock analysis (Fig. 4b). A typical fault-zone structure consists of a strain-localized core within a damage zone with densely distributed fractures, and the fault core usually corresponds to fault gouge at shallow levels in the crust (e.g., Biegel and Sammis 2004; Faulkner et al. 2010). However, in the Atera fault the fault zone includes the black fault breccia (sample FG04) near its center, a material with a relatively high friction coefficient and low clay mineral content. In addition, the breccia pinches out laterally between the brown gouge and the hangingwall (Fig. 5a). On a mesoscopic scale, the breccia is composed of angular quartz and feldspar grains with a clayey matrix and does not display shear fabric (see Figure 2 of Kato et al. 2015). In thin section, the grain size, mineral species, and texture of the breccia resemble those of the hangingwall host rock (Fig. 5b–e), and their mineral assemblages determined from X-ray patterns likewise coincide (Fig. 2). We conclude that the black fault gouge originated from the hangingwall granite. The major and trace element concentrations in and around the fault zone were analyzed by Kato et al. (2015), and the chondrite-normalized rare-earth element (REE) patterns of the fault-zone materials and surrounding host rocks resembled each other. These REE patterns are typical of granitic rocks and are consistent with those of Ryoke granites reported by Ishihara and Murakami (2006). These features could indicate that fault-zone materials and rocks of the footwall sediments were basically originated from the hangingwall granite (Kato et al. 2015). This could also support that the black fault breccia was derived from the hangingwall granite. As earthquakes repeat, progressive damage may lead to the development of a thicker fault core. It is well known that thicker fault zones have generally accommodated greater cumulative slip displacements (Scholz 1982, 1987; Hull 1988). Even though the intensity of deformation decreases exponentially with distance from the fault core (Vermilye and Scholz 1998), frictional sliding may cause damage to the surrounding host rock and erode its surface. In addition, because of the fractal nature of the boundary surface between a fault zone and host rocks (e.g., Power et al. 1987), there will always be places where asperities are in direct contact across the fault (Scholz 2002). In the Atera fault at Tase, the fault zone has an irregular contact with the hangingwall granite, but the latest slip zone cuts the older fault gouges and locally abuts the hangingwall (Figs. 1c, 5c), showing that the surrounding protolith was mechanically incorporated into the fault zone at the mesoscale. This is evidenced by similar REE patterns of the black fault breccia and of the hangingwall granite (Kato et al. 2015). Such incorporation of high friction material could cause the heterogeneity in friction strength of fault zones and might contribute to the evolution of fault-zone architecture. On the other hand, clay minerals, commonly the dominant component in fault gouge, originate by incorporation of clays from the protolith and by dissolution–precipitation reactions during and after faulting (Vrolijk and van der Pluijm 1999). Authigenic secondary minerals such as smectite have been observed to form following the breakdown of quartz and feldspar during laboratory shear experiments (Tenthorey et al. 1998). During seismic slip, ultrafine particles of amorphous material may be produced by comminution, granulation, and mineral lattice distortion (Yund et al. 1990; Hirono et al. 2014b). Amorphous particles are much more easily dissolved than crystalline grains of equivalent size (Icenhower and Dove 2000), promoting the formation of secondary minerals such as clays by precipitation from fluids in the fault (e.g., Tenthorey et al. 1998; Solum et al. 2005). However, in the Atera fault, no evidence that such amorphous material existed was observed, so this process is in general likely but could not be confirmed in the Atera fault. A negative anomaly of cerium concentration was detected in the light gray fault gouge, probably indicating that smectite and halloysite were precipitated from oxidative fluid of <110 and <80 °C, respectively (Kato et al. 2015). Experiments have demonstrated that the friction coefficient of a gouge containing clay minerals mixed with sand becomes lower as the clay content increases (Shimamoto and Logan 1981; Takahashi et al. 2007). Low friction coefficients have also been widely reported in natural faults, including 0.1–0.2 for fault gouge in the San Andreas fault (Carpenter et al. 2015) and 0.3 for fault gouge in the Taiwan Chelungpu fault (Mizoguchi et al. 2008). The low values in the fault gouges of the Atera fault could be ascribed to the presence of large amounts of clay minerals. Field observations and laboratory friction experiments show that the active zone of the Atera fault includes a breccia with a relatively high friction coefficient that originated from the hangingwall granite. Although fault zones generally contain large amounts of low friction clay minerals, widespread mesoscale incorporation of surrounding protoliths might cause the heterogeneity in friction strength of fault zones as well as the evolution of fault-zone architectures. NK and TH performed the fieldwork. NK carried out the friction experiments and microstructure observations. Both authors wrote the paper. Both authors read and approved the final manuscript. We thank Tomoyuki Ohtani, Tsuyoshi Ishikawa, Jun Kameda, and Wataru Tanikawa for supporting our fieldwork and friction experiment. We also thank Virginia G. Toy and an anonymous reviewer for their constructive reviews. This work was supported by a Grant-in-Aid for Exploratory Research (KAKENHI No. 15K13578) from the Japan Society for the Promotion of Science and by Grants-in-Aid for Scientific Research on Innovative Areas (Crustal Dynamics, KAKENHI No. 26109004) from the Ministry of Education, Culture, Sports, Science and Technology of Japan.